Working in the Barn Garden I dug up some delicate Impatiens pseudoviola which had self layered and produced many more new plants - it has strong magenta eyes of flower and is not frost hardy, so I stored it in the Begonia House. I lopped off heads of Euphorbia amygdaloides var. robbiae and put them in a paper bag and placed them on the radiator in the mess room. When the seeds are ready they will pop off the plant like popcorn. I cut back geraniums to about 3 inches. Then we topped up a long strip of bedding with Tulipa 'Ballerina' in the High Garden. 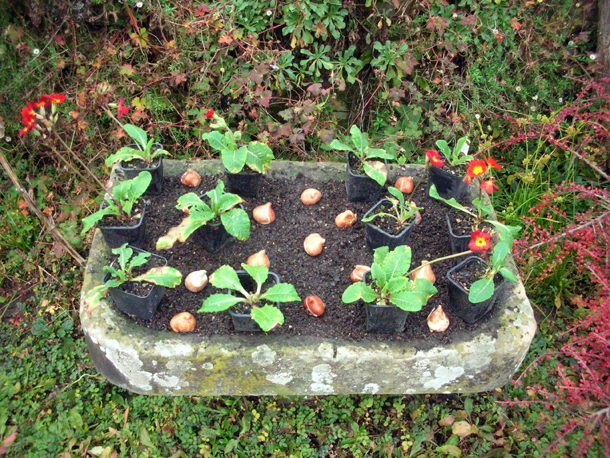 Then I planted some Polyanthus 'Crescendo Bright Red' in a trough in the Sunken Garden, which is providing colour already, and interplanted them with Tulipa 'Couleur Cardinal'. These primary coloured types polyanthus are some of my least favourite flowers, because of it's garish nature and the way I have seen it used in pots and bedding. But as always at Dixter challenges my prejudice of these plants and I am curious to see what the combination will look like. I noticed that crucially that they were to be placed right to the edge and not set regimentally straight and in line with each other.